A guide to keeping the Dwarf Chain Loach (Yasuhikotakia sidthimunki). Think of loaches. Think of clowns. Yet that ignores many other suitable candidates that can enrich your hobby. This 7 page article details a whole host of loach species from several different families. Providing for fish that grow large is serious business. The article covers setting up and maintaining an aquarium dedicated to these botiid giants. Covers care of the Weather Loach or Dojo Loach (Misgurnus anguillicaudatus). Covers setting up a Hillstream Loach tank, behaviour, feeding, etc. An introduction to Botiine Loaches. Available here with additional text. A guide to keeping kuhli loaches with details of breeding habits. 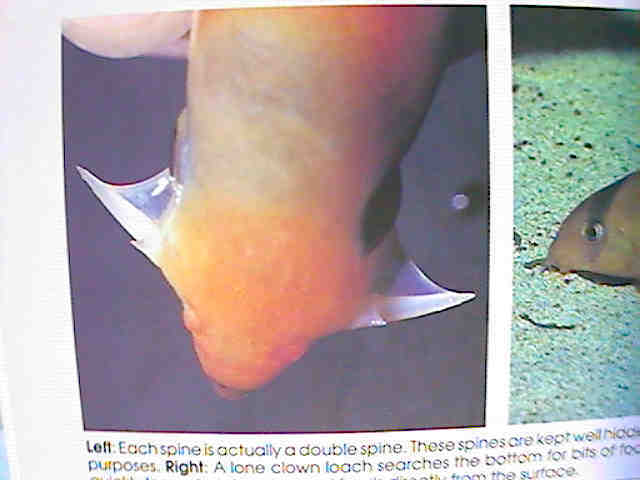 Article on Clown Loach nomenclature change, plus tips on how aquarists might go about breeding this species. Translated into Thai by Nonn Panitvong from the article by Martin Thoene. Text and photos by Martin Thoene with additional photos by Nonn Panitvong. Information on keeping many Botiine species plus comments on new taxonomy. Loaches covered: Kuhli, Myer's, or slimy loach (Acanthophthalmus (Pangio) myersi), Horse-faced or longnose loach (Acanthopsis choirorynchus), Clown loach, Chain or dwarf loach (Botia sidthimunki), Chinese algae eater or sucking loach (Gyrinocheilus aymonieri), and Japanese, weather, or Dojo loach (Misgurnus anguillicaudatus). The author covers the kuhli loach, clown loach, Orange-Finned Loach (Botia modesta), Dwarf Loach (Botia sidthimunki), and Weather Loach (Misgurnus fossilis). Large color photos are provided, along with a beginners rating on a scale of 1-10. Practical Fishkeeping : Stripes Are In!